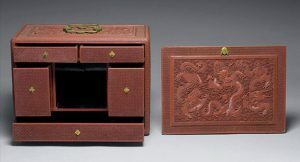 A lacquer portable cabinet of rectangular format with a separate front panel. Behind this panel is a fitted interior comprising two small, hinged doors on either side of central cavity. Two drawers are placed above the cavity and one long drawer is placed below it. The cabinet is carved overall with minutely detailed scenes of figures in landscape settings. The front panel depicts two men in flowing robes standing on a balustraded terrace, accompanied by a servant who carries a flower basket. They watch three ladies in a log boat sailing towards them. Two further figures can be observed in the foreground. The back is carved with a scene of scholars gathering on the border of a lake among lush vegetation. The two sides and the top are similarly decorated. A densely scrolled key-fret border, with recessed panels of hexagonal diaper pattern, frames all carved panels. The small doors and drawer fronts on the interior are carved with an overall pattern of hexagonal diapers. Two hinged handles in giltbronze with ruyi-shaped finials allow the cabinet to be carried. The lock plate and drawer pulls are also fashioned in giltbronze. The interior of the drawers, the front panel, and the base of the cabinet are lacquered black. Portable cabinets with compartments for storing smaller items such as seals, paper and brushes were a practical necessity for the scholar, enabling him to move a multitude of paraphernalia easily and quickly. 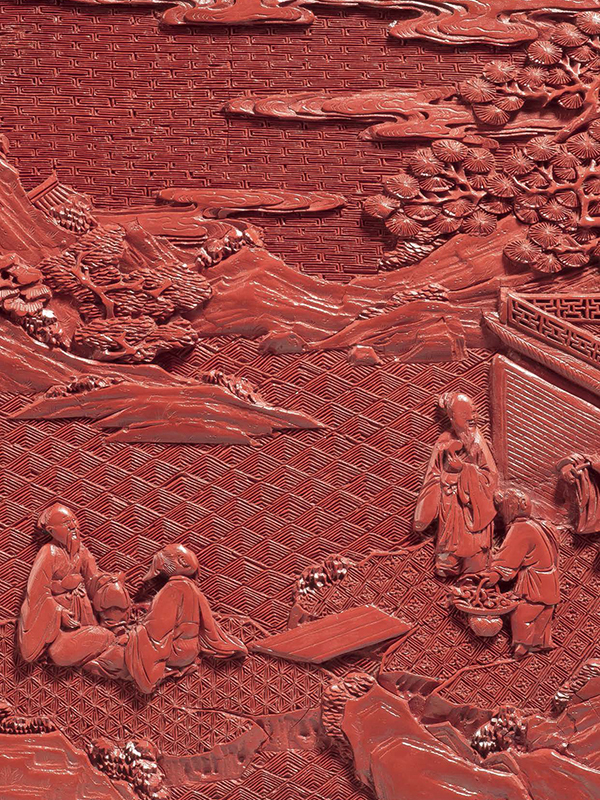 The scenes carved on the exterior of this lacquer box can perhaps be interpreted as alluding to an idyllic scholar’s life, but they also carry much symbolism when the figures are identified as Daoist immortals carrying an array of symbols associated with longevity, such as peaches, flower baskets and lingzhi. 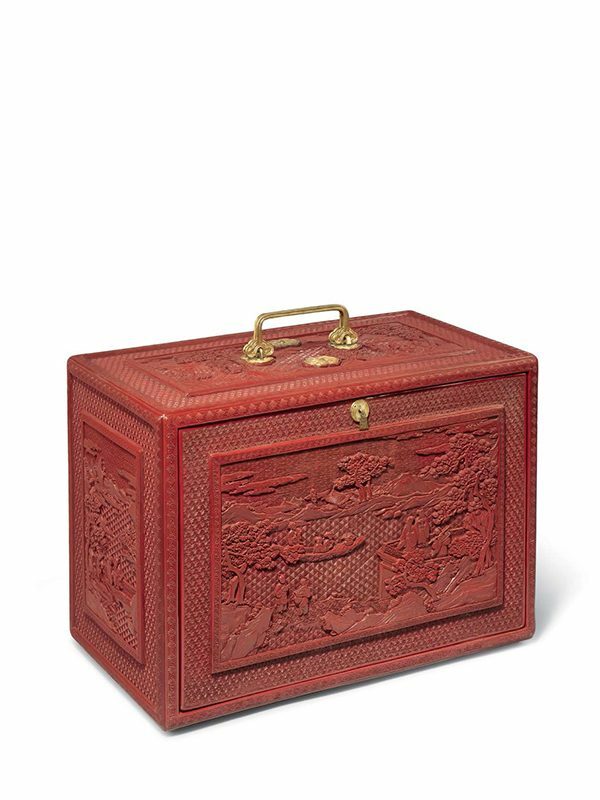 A closely comparable cabinet is in the collection of the National Palace Museum, Taipei. 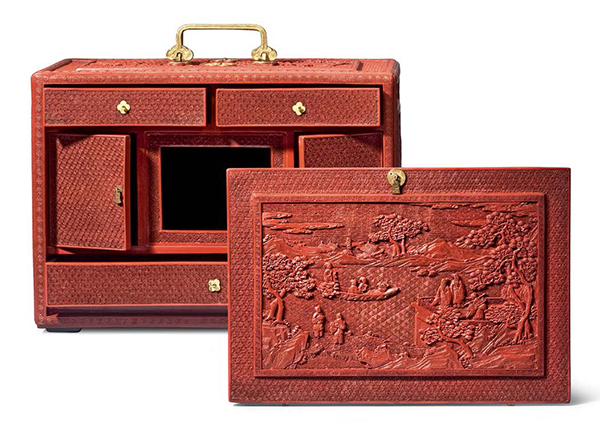 It has the identical form, fall-front panel, fitted interior and giltbronze carrying handles, but is carved with dragons instead of figures in a landscape setting (fig. 1). Two further cabinets of slightly different form, each with hinged outer doors and carved with scenes of figures in a landscape, are in the Irving collection at the Metropolitan Museum in New York  and in the Palace Museum in Beijing. Palace Museum, Gugong Bowuyuan Cang Diaoqi (Carved Lacquer in the Collection of the Palace Museum), Beijing 1985, no. 296.